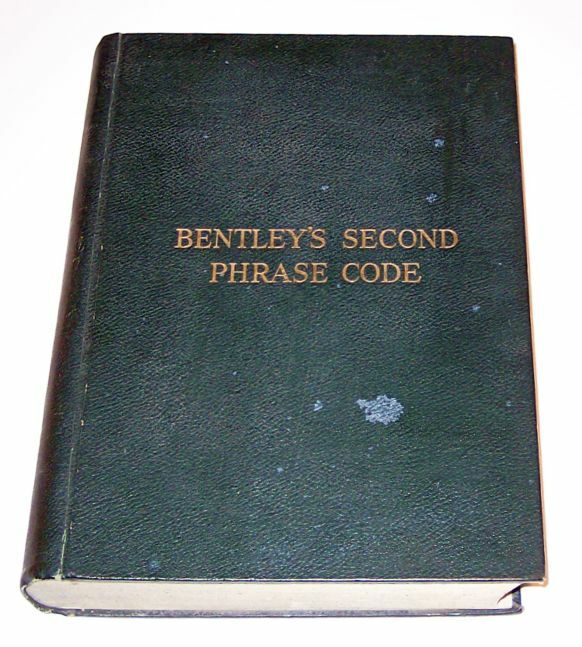 Click for larger photo Source: Personal Collection Bentley's Second Phrase Code - 9th Reprint - 1964. Large volume with 780 pages. No other information found on the web. 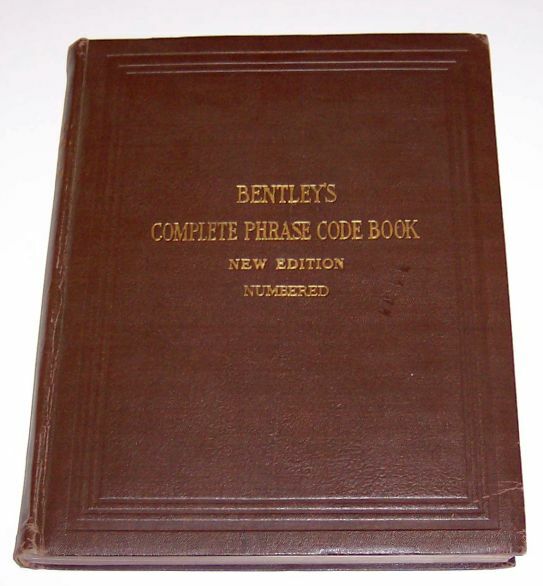 Click for larger photo Source: Personal Collection Bentley's Complete Phrase Code Book - New Edition Numbered - 1916. Medium size volume with 325 pages. No other information found on the web. Click for larger photo Source: Personal Collection Internationales Signalbuch - Berlin 1911. 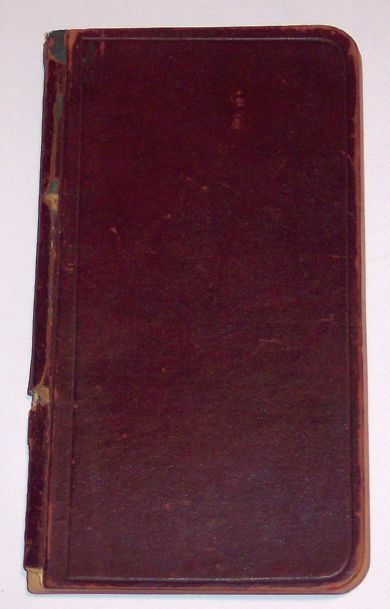 Large volume with 450 pages. No other information found on the web. Click for larger photo Source: Personal Collection Imperial Code - Friederichsen & Co. - Hamburg - 1906. 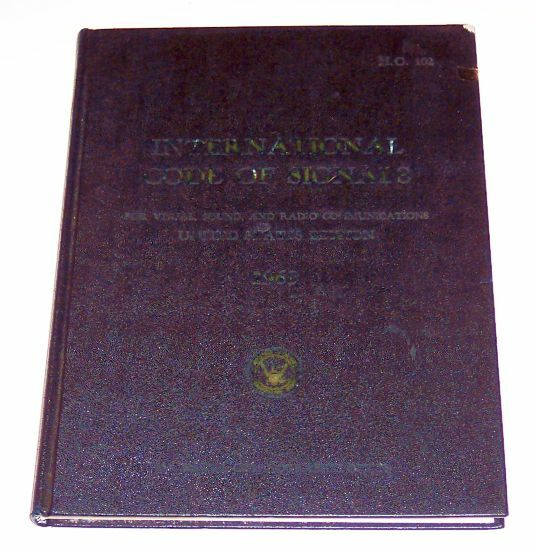 Large volume with 107 pages. Here is a photo of the first page. No other information found on the web. Click for larger photo Source: Personal Collection Code International de Signaux - Edition Francaise - 1933. Grand volume avec 709 pages. Aucune autre information sur le web. Click for larger photo Source: Personal Collection Code Télégraphique de Lieber - 1901. 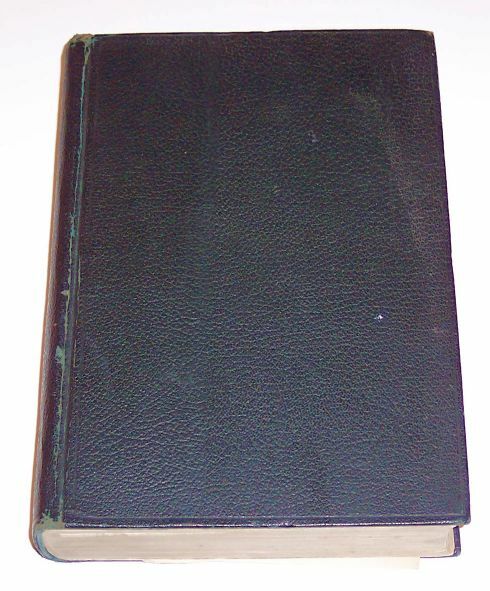 Volume de taille moyenne avec 804 pages. Aucune autre information sur le web. 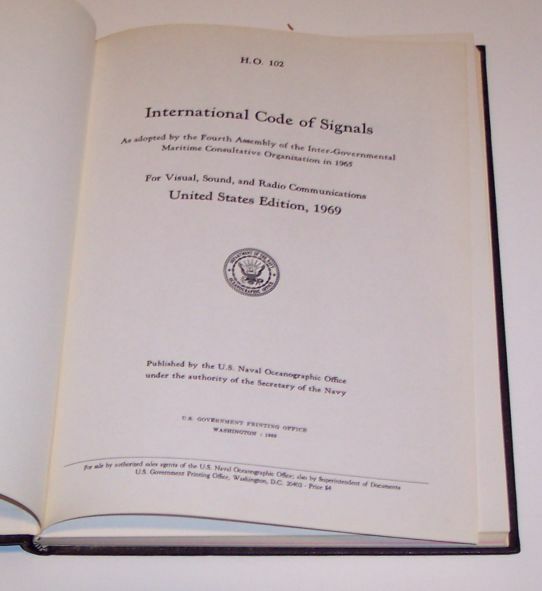 Click for larger photo Source: Personal Collection International Code of Signals - United States Edition - 1969. Here is a first page. Medium size volume with 139 pages followed by appendices. No other information on the web. Click for larger photo Source: Personal Collection Vocabulaire Lugagne - 1912. 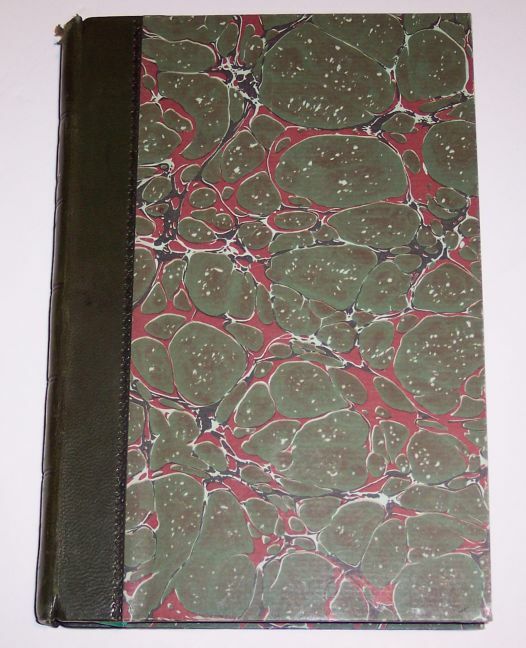 Volume de taille moyenne avec 252 pages. Voici une photo de la première page. Aucune autre information sur le web. 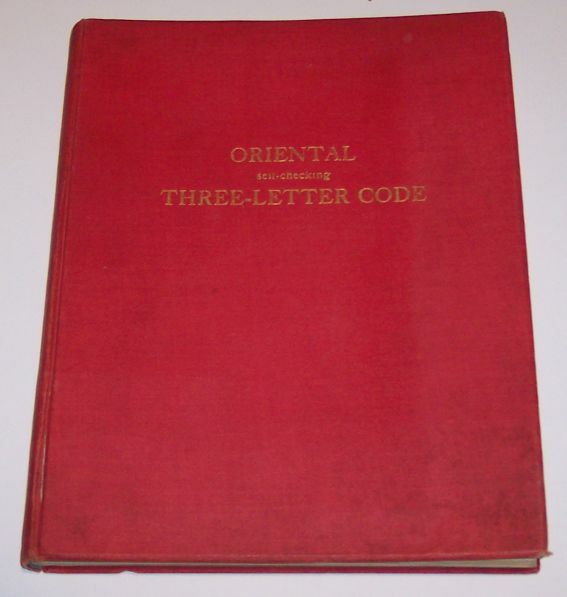 Click for larger photo Source: Personal Collection Oriental (self-checking) Three-Letter Code - Circa 1934. Medium size volume with 155 pages plus appendices. Author is K. Yamaguchi and publisher is Matsumoto Printing Co. No other informationd found on the web. Click for larger photo Source: Personal Collection A-Z Code Télégraphique Français - Circa 1903. 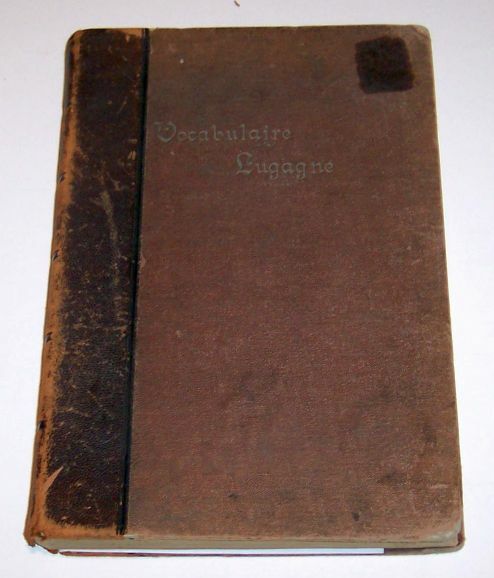 Volume de taille moyenne avec 397 pages plus les annexes. Aucune autre information sur le web. Click for larger photo Source: Personal Collection A-Z Code Télégraphique Français - 1944. 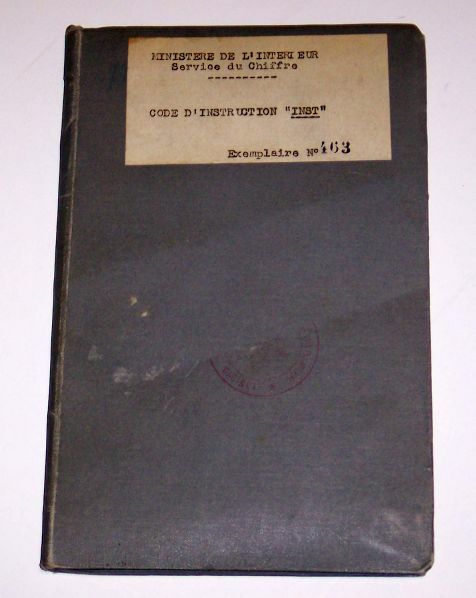 Volume de petite taille avec 92 pages jadis classifié "SECRET" sous le Commandement des Transmissions des Forces Terrestres. Aucune autre information sur le web. Click for larger photo Source: Personal Collection ABC Telegraphic Code (5th Edition) - 1901. Medium size book with 1400 pages. Aucune autre information sur le web. 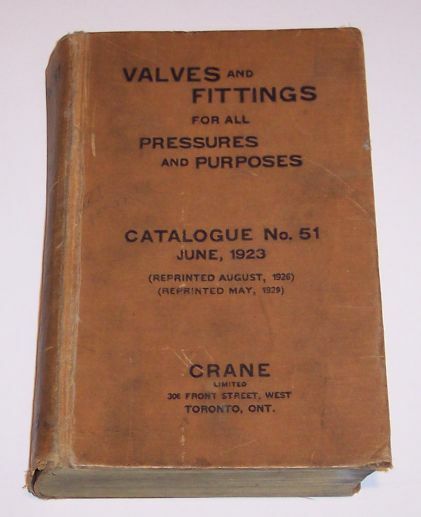 Click for larger photo Source: Personal Collection Crane Valves and Fittings (Catalogue No. 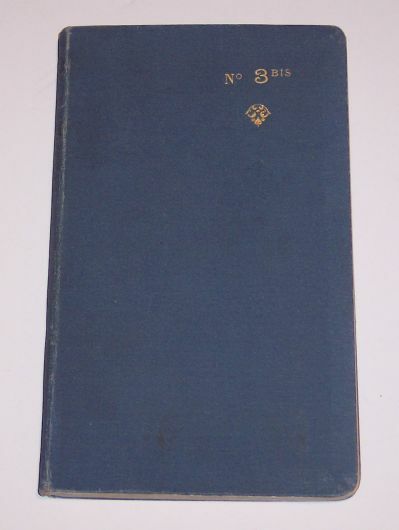 51) - 1929 reprint of 1923 edition. Small size book with 743 pages. 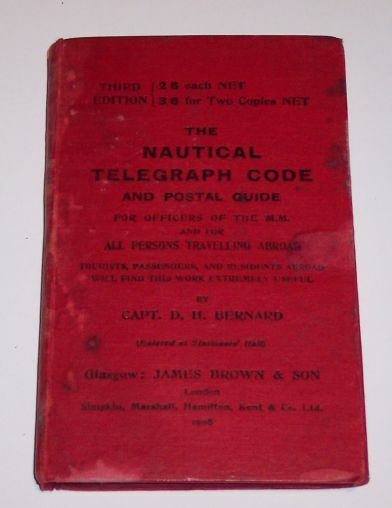 The book has a few pages on telegraphic codes. 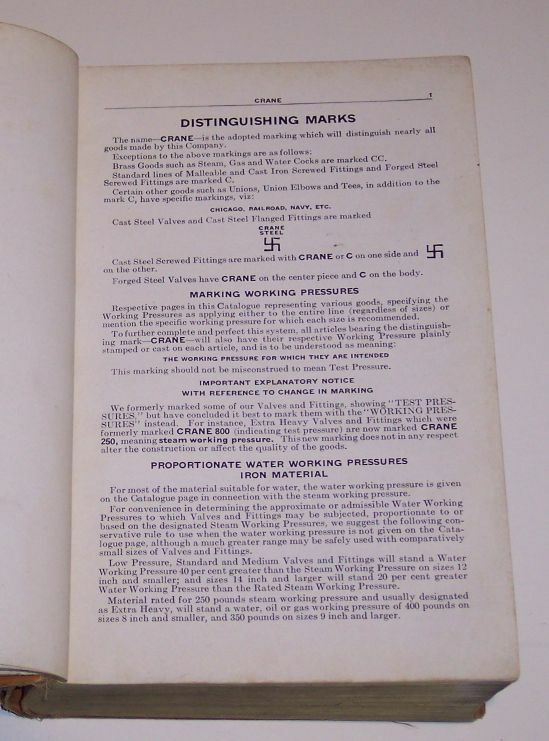 Here is a photo of a page with the Crane logo on their products in 1923 - interesting! No other information found on the web. Click for larger photo Source: Personal Collection A1 Telegraphic Code - Estimate at 1887. Medium size book with 1240 pages. The book is a companion to the ABC Telegraphic Code book. 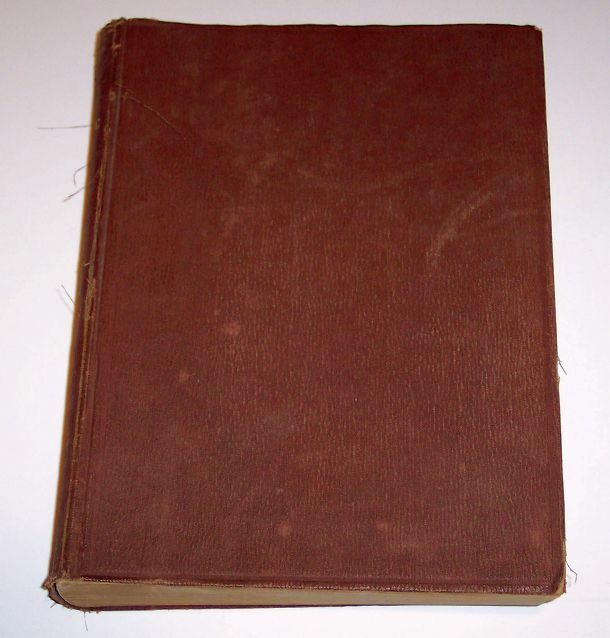 Collector Fred Brandes has a webpage with further data on this book. 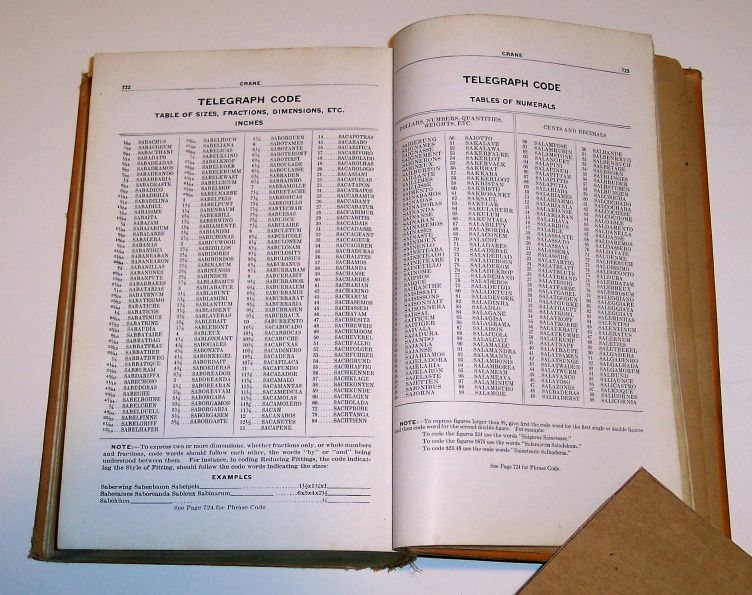 Click for larger photo Source: Personal Collection ABC Telegraphic Code by American Code Company (5th Edition) - 1901. Medium size book with 1400 pages. 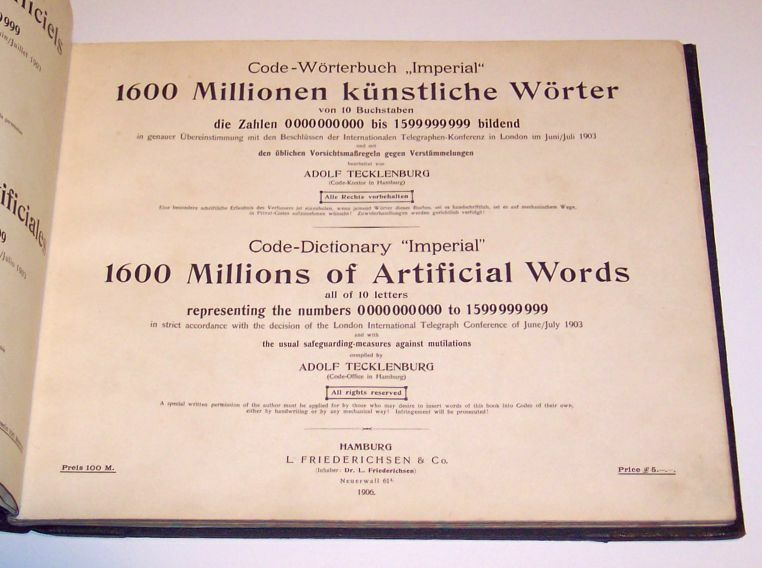 Click for larger photo Source: Personal Collection Lieber's Five-Letter American Telegraphic Code - 1915. Medium size book with 802 pages. No other information found on the web. Click for larger photo Source: Personal Collection The Nautical Telegraph Code - 1908. Small size book with 172 pages. Devised by D.H. Bernard. No other information found on the web. 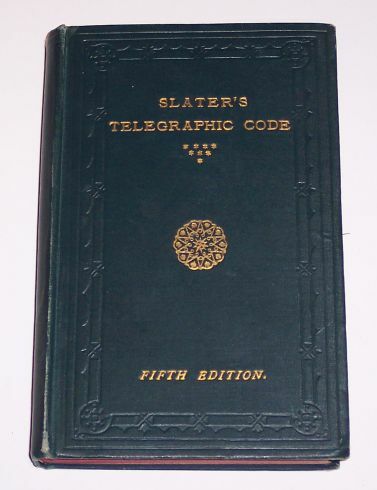 Click for larger photo Source: Personal Collection Slater's "Telegraphic Code to Ensure Secresy" (4th Edition) - No date. Small size book with 250 pages. Devised by Robert Slater. No other information found on the web. 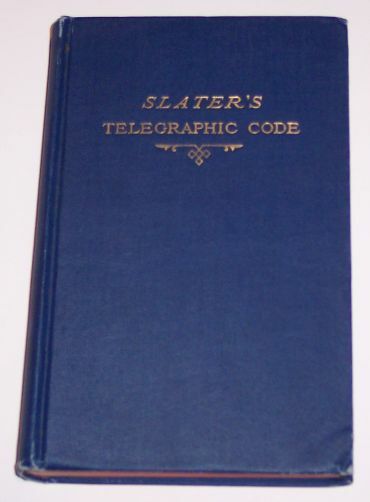 Click for larger photo Source: Personal Collection Slater's "Telegraphic Code to Ensure Secresy" (5th Edition) - 1906. Small size book with 250 pages. Devised by Robert Slater. No other information found on the web. Click for larger photo Source: Personal Collection Slater's "Telegraphic Code to Ensure Secresy" (6th Edition) - No date. Small size book with 250 pages. Devised by Robert Slater. No other information found on the web. 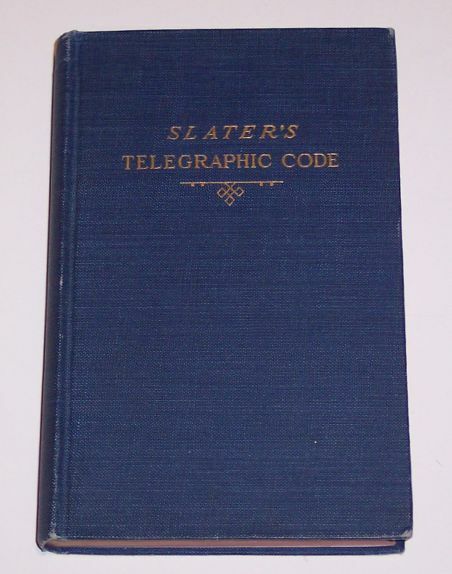 Click for larger photo Source: Personal Collection Slater's Telegraphic Code - 7th Edition - 1923. Small size book with 250 pages. Devised by Robert Slater. No other information on the web. 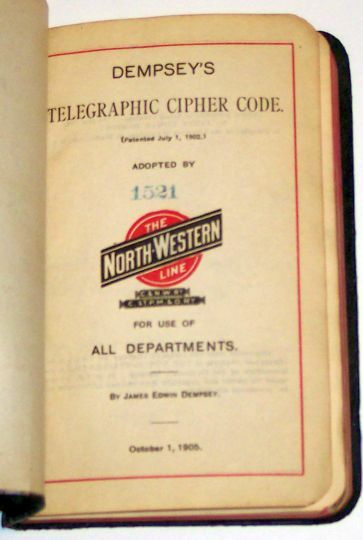 Click for larger photo Source: Personal Collection Dempsey's Telegraphic Cipher Code - 1905. Small size book with 230 pages. Devised by James Edwin Dempsey. "Adopted by The North-Western Line" intended for use of all departments". Here is a photo of the first page. No other information found on the web. Click for larger photo Source: Personal Collection The Chesapeake & Ohio Railway Co. Cipher Code - 1930. 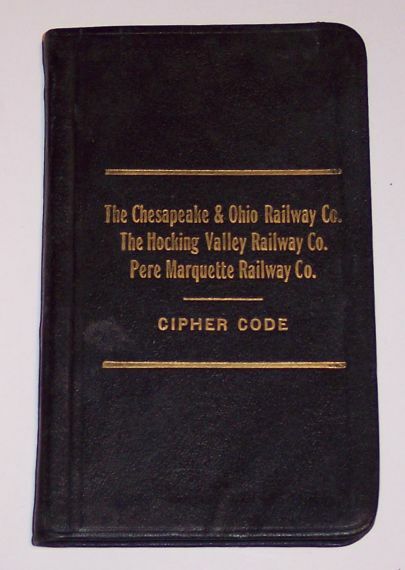 Small size book with 171 pages and actually titled "The Chesapeake & Ohio Railway Co., The Hocking Valley Railway Co., Père Marquette Railway Co. Cipher Code". No other information found on the web. 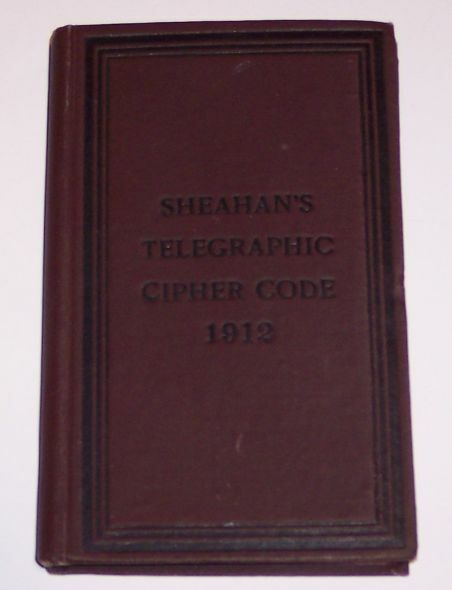 Click for larger photo Source: Personal Collection Sheahan's Telegraphic Cipher Code - 1912. Small size book with 200 pages. No other information found on the web. 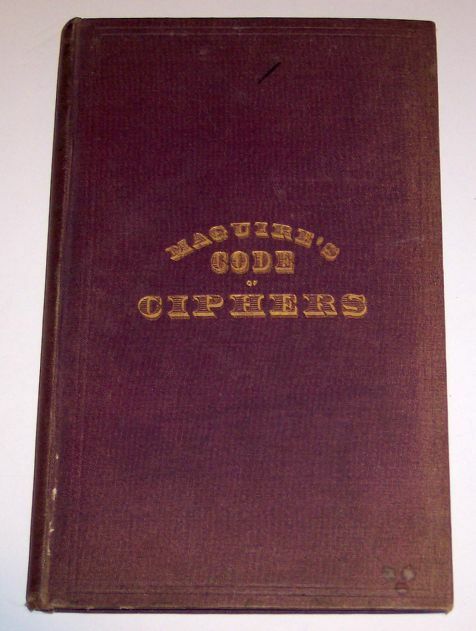 Click for larger photo Source: Personal Collection "Maguire's Code of Ciphers - A Comprehensive Systems of Cryptography" - 1880. Small size book with 113 pages. Devised by Charles H.J. Maguire, Chief Accountant of the Union Bank of Lower Canada (Quebec). No other information found on the web. 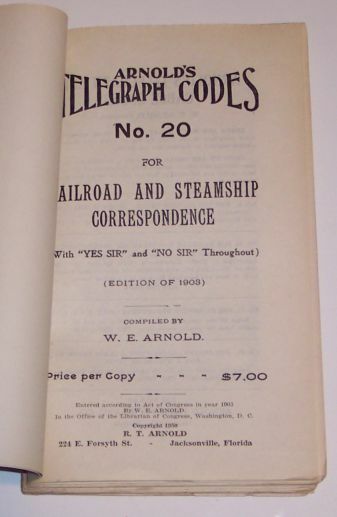 Click for larger photo Source: Personal Collection "Arnold's Telegraph Codes No. 20" - 1950. Small size book insert deck with 216 pages. Compiled by W.E. Arnold. No other information found on the web. 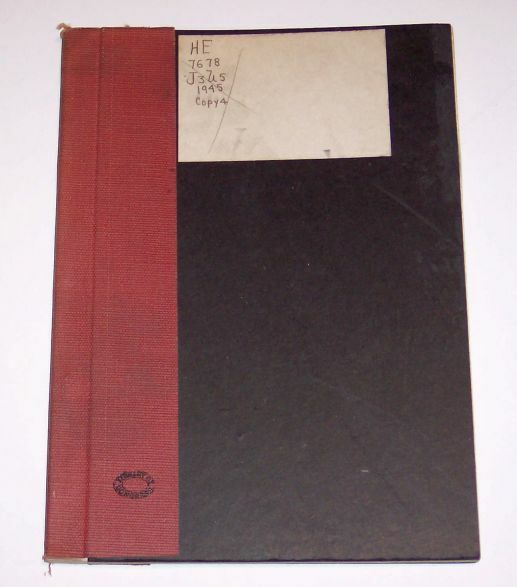 Click for larger photo Source: Personal Collection "Arnold's Cipher No. 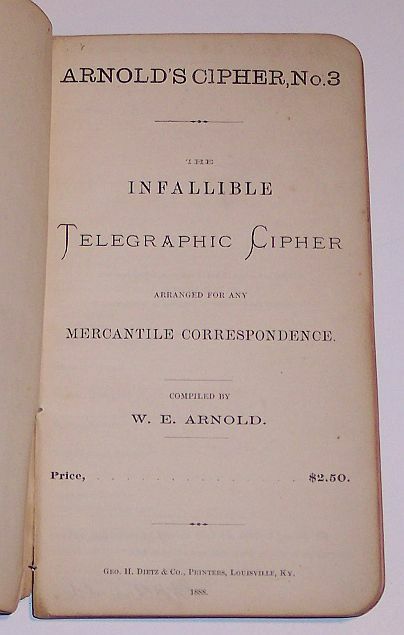 3 - The Infallible Telegraphic Cipher" - 1888. Small size book deck with 90 pages. Compiled by W.E. Arnold. Here is a photo of the first page. No other information found on the web. Click for larger photo Source: Personal Collection "Telegraphic Cipher Code - Especially adapted to the Cotton Trade" - 1878. Small size book deck with 207 pages. Devised by A.B. Shepperson. I have two copies. No other information found on the web. 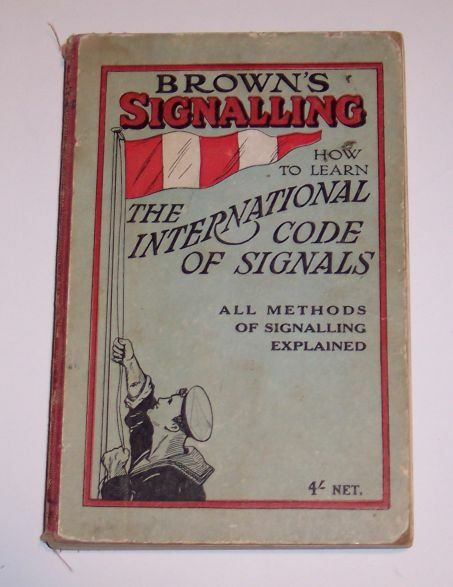 Click for larger photo Source: Personal Collection "Brown's Signalling - How to Learn the International Code of Signals" - 1940. Small size book deck with 220 pages. Authored by W.K Stewart. No other information found on the web. 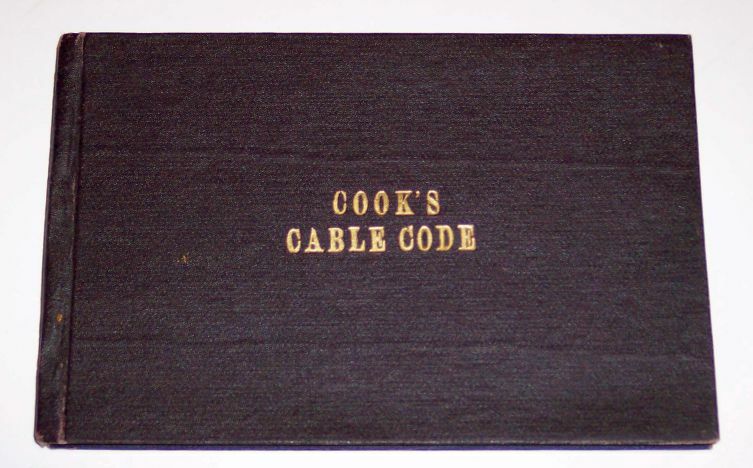 Click for larger photo Source: Personal Collection Cook's Cable Code - "The Belleville Cable Code" - No date. Small size book deck with 156 pages. Intended to code information related to Canadian dairy goods such as butter and cheese. No other information found on the web. 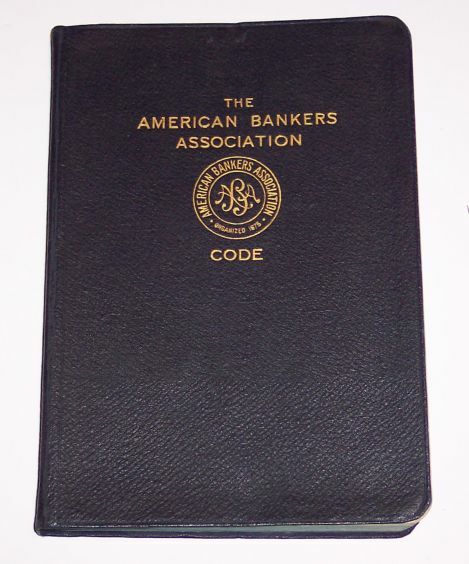 Click for larger photo Source: Personal Collection The American Bankers Association Code - "For Private and Confidential Use by its Members" - 1914. Small size book deck with 256 pages. No other information found on the web. Click for larger photo Source: Personal Collection The Service Code - "For Naval and Military Officers and All Who Travel" - 1908. Small size book deck with 456 pages. 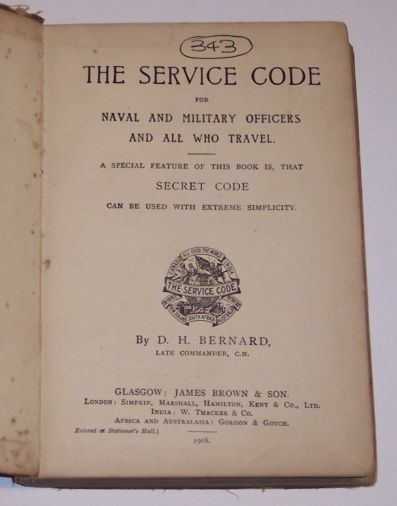 Author is D.H. Bernard. Here is a photo of the first page. No other information found on the web. 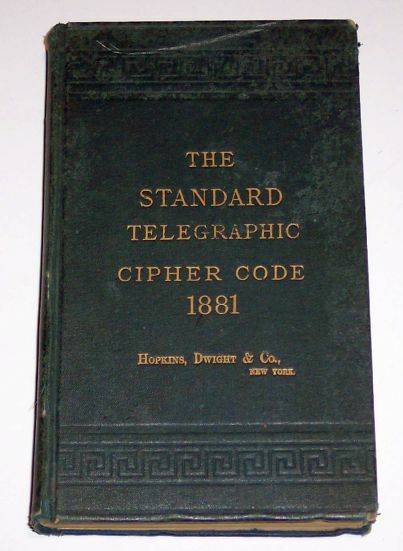 Click for larger photo Source: Personal Collection The Standard Telegraphic Cipher Code - 1881. Small size book deck with 306 pages. 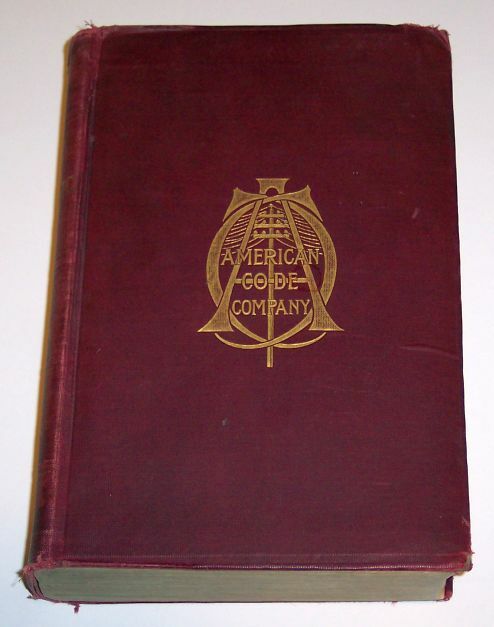 Devised by Alfred B. Shepperson and for the use of Hopkins, Dwight and Company in New York. No other information found on the web. 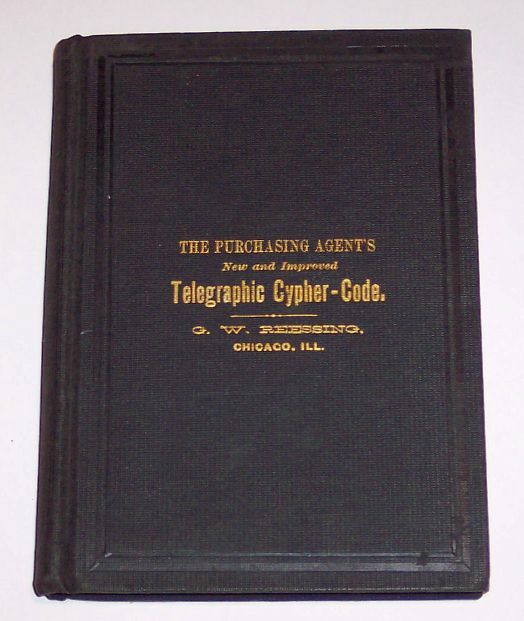 Click for larger photo Source: Personal Collection The Purchasing Agent's New and Improved Telegraphic Cipher-Code - 1885. Small size book deck with 300 pages. Compiled by G.W. Reessing and adapted to the use of wholesale grocers, fruiterers, provision & fish dealers, produce, etc. No other information found on the web. 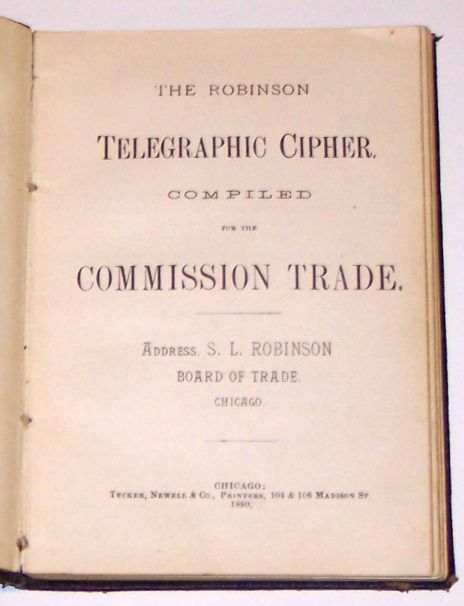 Click for larger photo Source: Personal Collection The Robinson Telegraphic Cipher Compiled for the Commission Trade - 1880. Small size book deck with 94 pages. Devised by S.L. Robinson. Here is a photo of the first page. No other information found on the web. 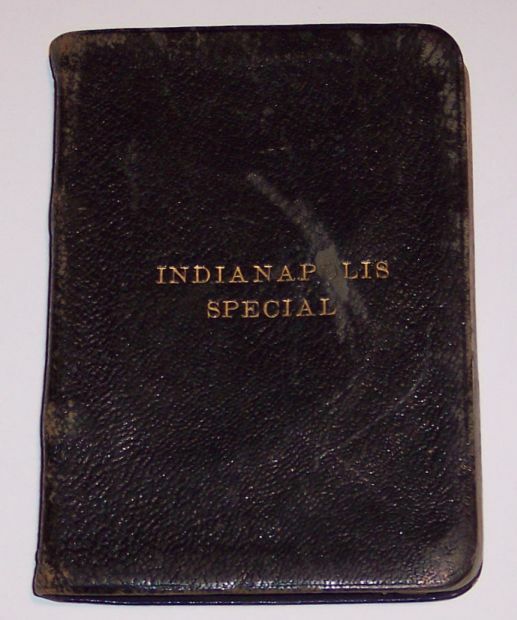 Click for larger photo Source: Personal Collection Indianapolis Special - Private Code Book Washburn-Crosby Co. - 1915. Small size book deck with 180 pages. No other information found on the web. 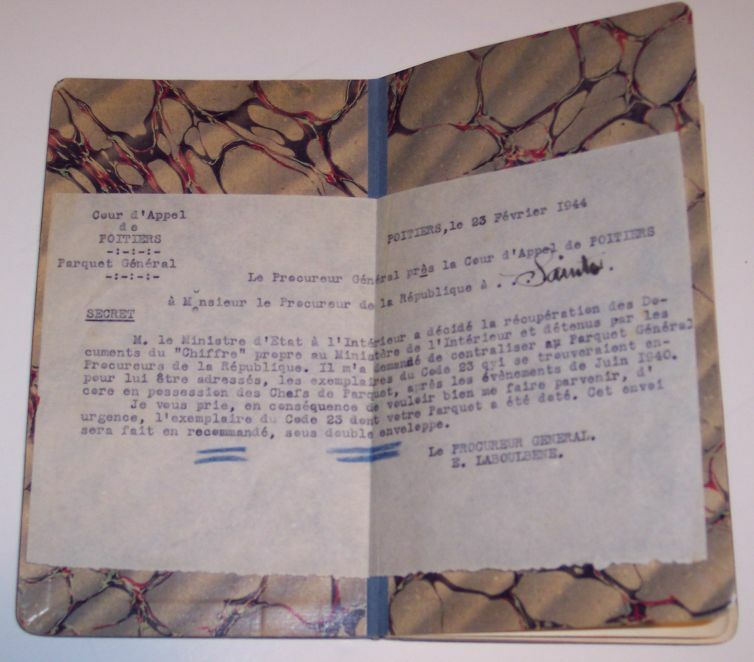 Click for larger photo Source: Personal Collection Chiffre No 3BIS - 1944. Petit livret avec chiffre pour le Ministère de l'Intérieur. Voici une photo d'une note insérée entre la couverture et la première page. Comprend 126 pages. Aucune autre information sur le web. Click for larger photo Source: Personal Collection Tableau des Signes de Ponctuation et Indications Diverses - Sans date. 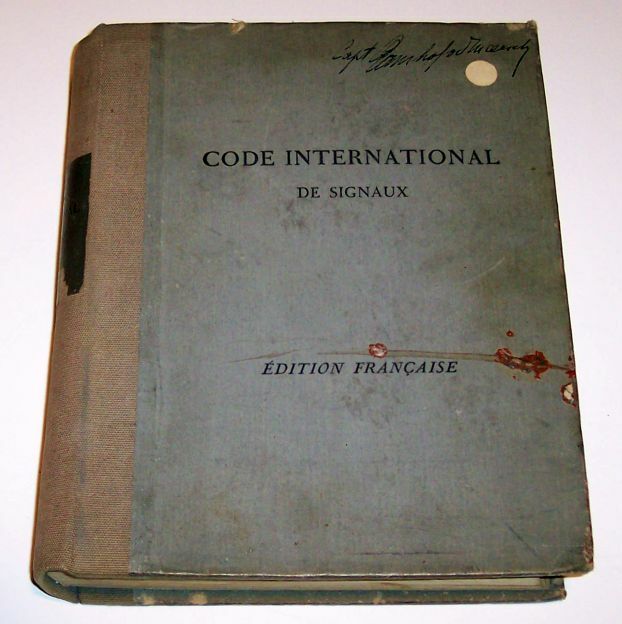 Petit livret avec chiffre pour le Ministère de l'Intérieur désigné "Code d'Instruction "INST". Voici une photo des premières pages. Comprend 111 pages. Aucune autre information sur le web. Click for larger photo Source: Personal Collection Langue Télégraphique Universelle ou Code de Signaux adopté par les marines marchandes de France et d'Angleterre - 1822. Petit livre avec 200 pages approximativement (pages non-numérotées). Rédigé par E. et M. Luscombe (agents de Lloyd's). Aucune autre information sur le web. 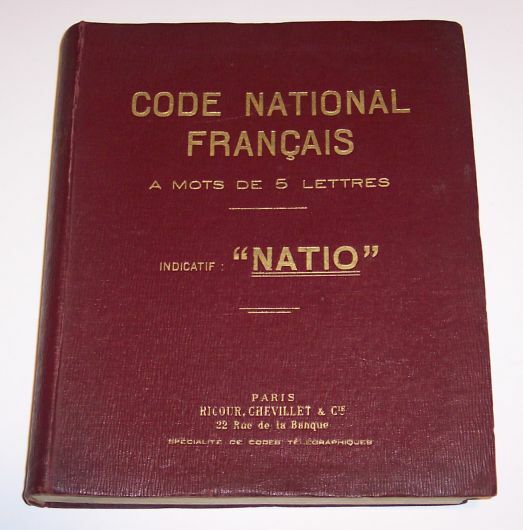 Click for larger photo Source: Personal Collection Code National Français à mots de 5 lettres avec indicatif "NATIO" - 1928. Gros volume avec 674 pages. Aucune autre information sur le web. (Photo forthcoming) Chiffre No. 5 - 1908. Tableau Spécial pour l'emploi du 5e chiffre, Signes conventionnels, ponctuation, code général et mots conventionnels pouvant servir en cas de missions spéciales. Aucune autre information sur le web. 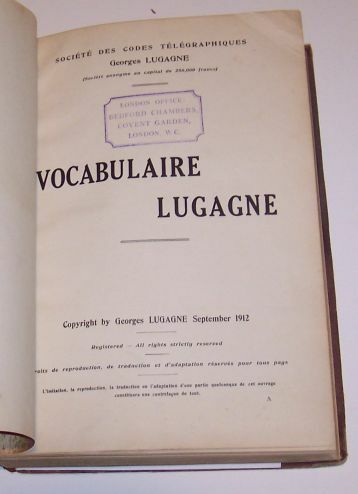 Click for larger photo Source: Personal Collection "Dictionnaire des mots à utiliser comme Mot Conventionnels" - Avril 1957. 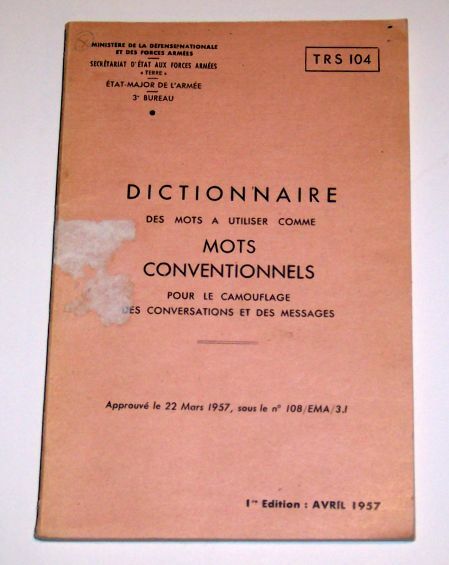 "Dictionnaire des mots à utiliser comme Mot Conventionnels - Pour le camouflage des conversations et des messages"- TRS 104. 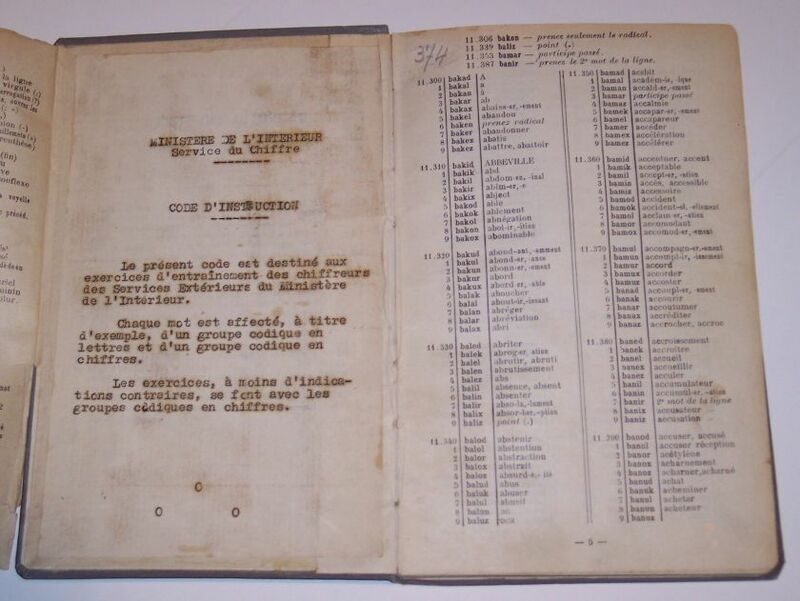 Ayant 144 pages, publié par le Secrétariat d'Etat aux Forces Armées. Aucune autre information sur le web. 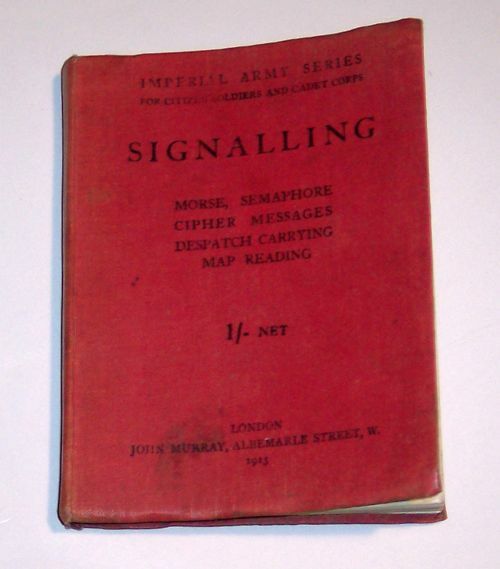 Click for larger photo Source: Personal Collection "Signalling" - 1913. 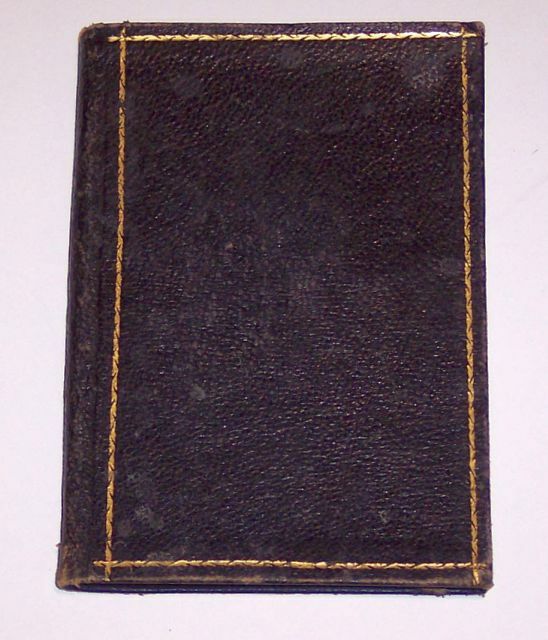 Small book containing 173 pages written by E. John Solano of the Imperial Army Series of publications. 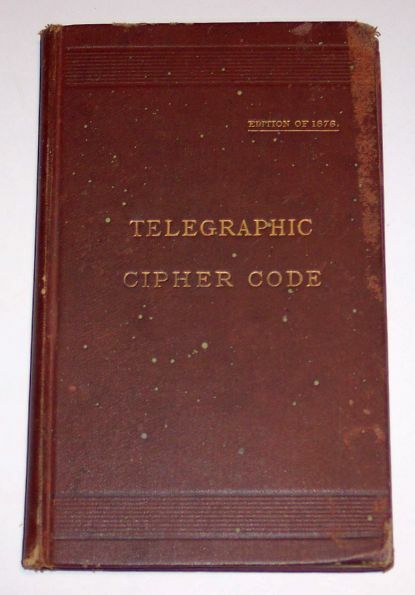 Covers ciphers and cipher messages. Limited research done so far on web or other references. 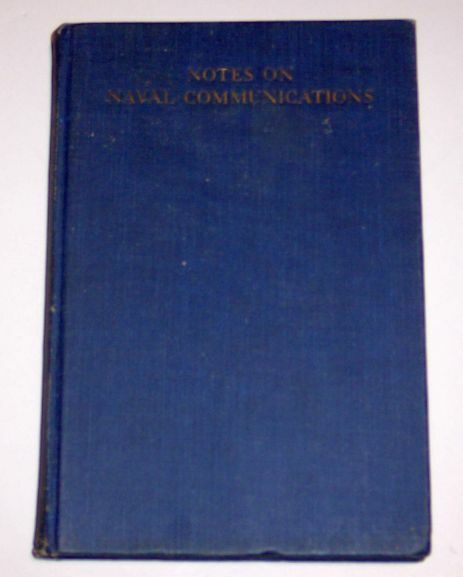 Click for larger photo Source: Personal Collection "Notes on Naval Communications" - 1924. Small book containing 160 pages compiled by Lieut. 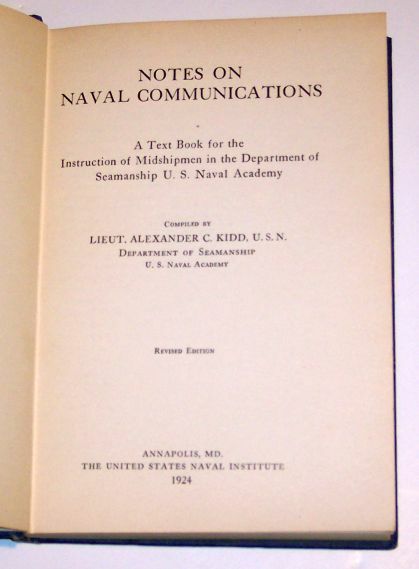 Alexander Kidd USN in the Department of Seamanship at the U.S. Naval Academy. Here is a photo of the title page. Limited research done so far on web or other references. 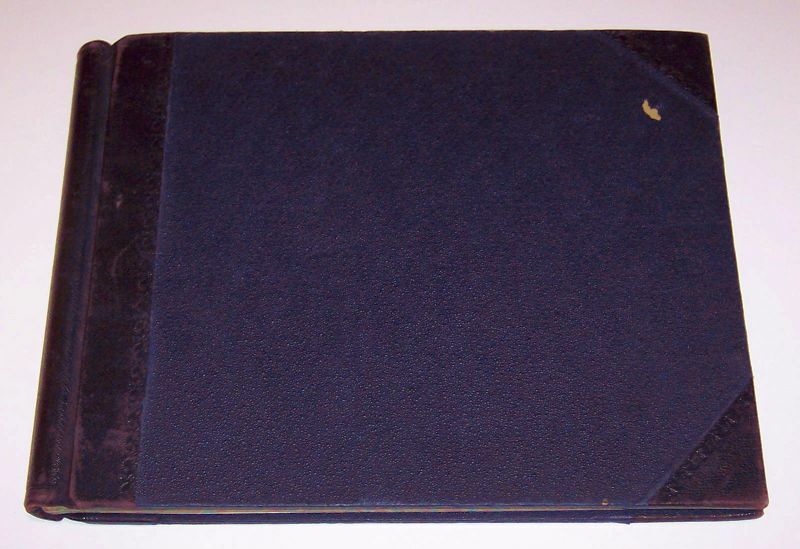 (Photo forthcoming) Signal Book - United States Army - 1916. Small book of which I have two copies. Limited research done so far on web or other references. 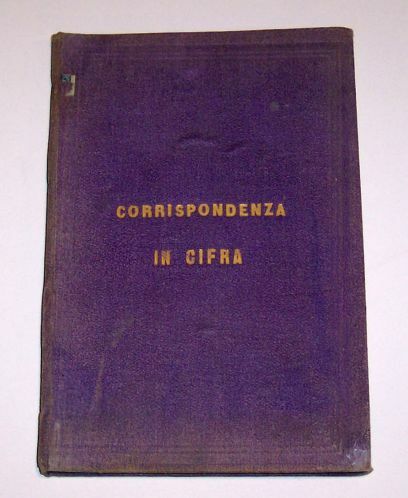 Click for larger photo Source: Personal Collection "Dizionario per Corrispondenza in Cifra" - 1878. Compiled by Paolo Baravelli. Small booklet containing 99 pages. Limited research done so far on web or other references. 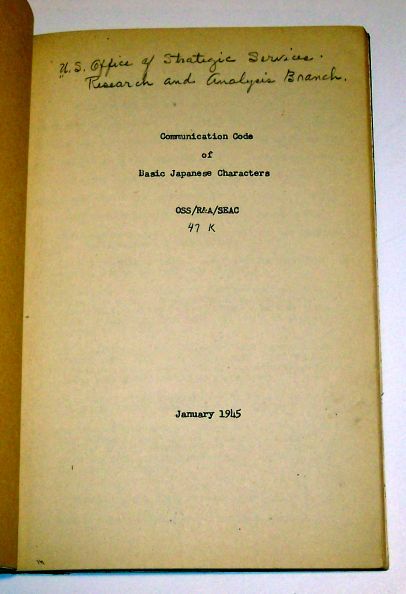 Click for larger photo Source: Personal Collection "Communication Code of Basic Japanese Characters" - January 1945. 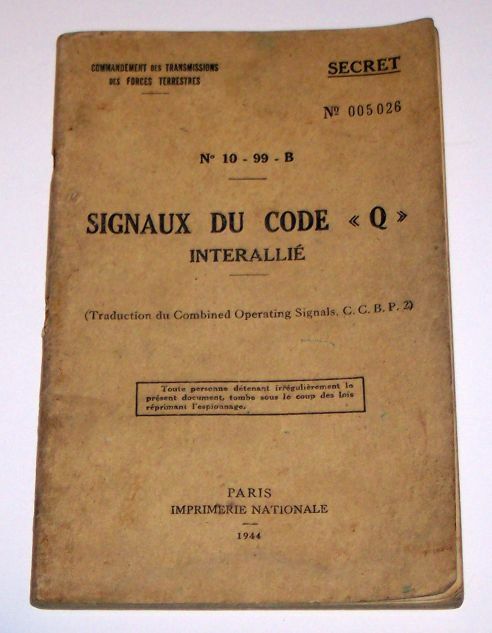 Small booklet containing about 60 pages published by OSS/R&A/SEAC (47 K). Here is a photo of the title page. Limited research done so far on web or other references. 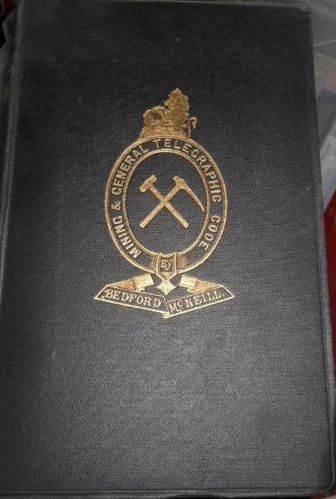 Click for larger photo Source: Personal Collection "Mining & General Telegraphic Code" based on McNeill's Code - 1899. Book containing about 807 pages published by The Scientific Publishing Company (U.S.) and Whitehead, Morris & Co. (U.K.). Limited research done so far on web or other references. 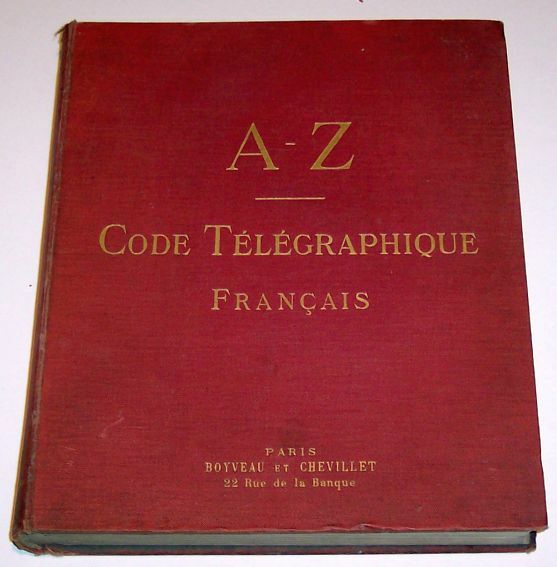 "A List of Telegraphic Codes"